The NIRF India Ranking 2018 was released in 9 categories which included Overall, Universities, Engineering, Colleges, Management, Pharmacy, Medical, Architecture, and Law. 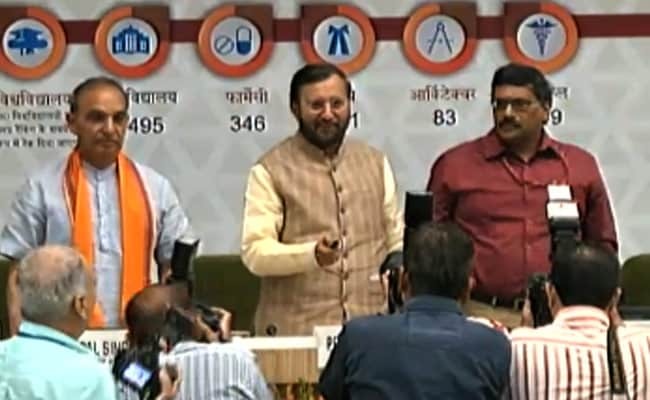 New Delhi: Ministry of Human Resource Development (HRD)'s National Institutional Ranking Framework (NIRF) is released today by the minister Prakash Javadekar. The NIRF India Ranking 2018 was released in 9 categories which included Overall, Universities, Engineering, Colleges, Management, Pharmacy, Medical, Architecture, and Law. In overall category IISc Bangalore ranked first while IITs made their presence in major categories like Overall, Universities and Engineering. In Law, Medical and Architecture, HRD awarded only three institutes this year, while in other categories top 10 institutes were honoured. While AIIMS was adjudged the best medical college, IIT-Kharagpur and National Law School of India University, Bengaluru topped in architecture and law categories, respectively. Among the top 10 institutes in the overall category were IISc, six IITs in Madras, Bombay, Delhi, Kharagpur, Kanpur and Roorkee, JNU, BHU and Anna University in Chennai. The HRD Ministry has made participation by public institutions in the national institutional ranking framework (NIRF) mandatory from next year, Mr Javadekar announced today. "And, those public institutions which will not take part in it will face fund cut," the minister said. He was addressing a function here to announce the names of best institutions under the NIRF. Participation in the ranking framework was earlier optional. In the third edition of the rankings, a total of 2,809 institutions have participated in nine categories -- overall, universities, engineering, colleges, management, pharmacy, medical, architecture and law. Collectively they have submitted 3,954 distinct profiles, some in multiple disciplines/categories. This includes 301 universities, 906 engineering institutions, 487 management institutions, 286 pharmacy institutions, 71 law institutions, 101 medical institutions, 59 architecture institutions and 1087 general degree colleges.